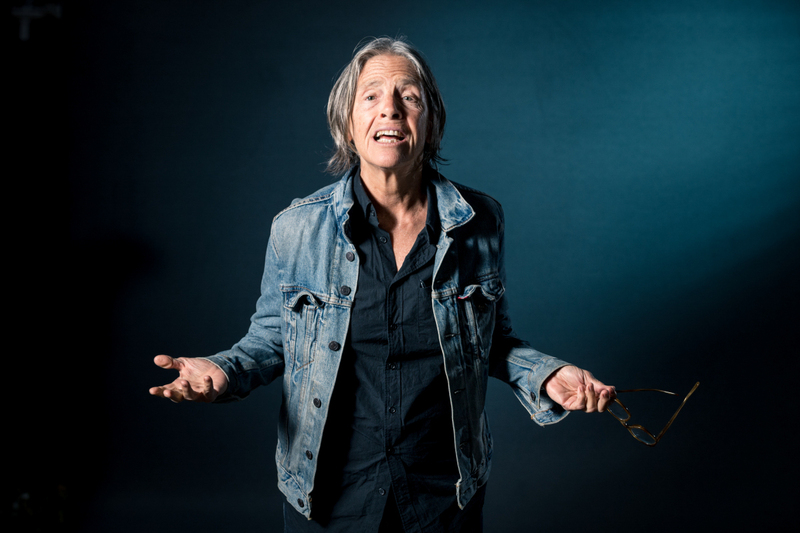 When Eileen Myles reads, they sound as if they are speaking. Full of natural pauses, asides, and tangents, their poetry read aloud is akin to being led through a forest while blindfolded. We’re introduced to Myles’ dog Walter, the sights outside their car window, as well as frustrating lovers. We envision a world where they are president: there’s a Department of Women, homeless people sheltered in the White House, and for some reason, we all get really good at archery. During their reading at Russell House Monday night, Myles guided us through all of these corners with their laid-back yet caustic wit—taking us on a trip that was at times laugh-out-loud funny, consciously reflective, and unflinchingly brazen. After concluding the final workshop of their three-session master class at the Shapiro Center, Myles trekked across campus to read from their forthcoming poetry collection “Evolution,” slated to be published in the fall through Grove Atlantic. As they read, they commanded a strong presence, but it was curiously difficult to discern between when they were beginning the first line of a poem or continuing to give backstory to it, demonstrative of Myles’ colloquial and chatty poetic style. It’s reminiscent of Frank O’Hara’s stream of consciousness narration, as well as that of other New York School poets. This makes perfect sense, as Myles spent the early years of their career studying under the likes of Ted Berrigan and Alice Notley, before going on to lead the Poetry Project housed in New York’s St. Mark’s Church. Like the New York School poets before them, Myles’ narrative voice careens and veers as it moves a poem forward, making jumping connections that lose focus yet maintain their capability to be evocative. During the hourlong reading, Myles read from twelve poems from “Evolution”—some long and plot-driven, others brief and thought-provoking. Before reading “Car Notebook,” Myles gave audiences some context about where they drew inspiration for the piece. “As a poet, I’m kind of an art school wannabe,” they said. Following the exercises introduced to them by an art school-adjacent friend, Myles spent an afternoon observing everything they saw outside of their car window. Though the original assignment has the artist drawing everything they see, Myles adapted it to their craft, reciting everything they took note of orally, as their girlfriend transcribed the outpouring of words while sitting shotgun. Anyone familiar with Myles’ work knows that the label “art school wannabe” is a gross underestimation of the writer’s accomplishments. They overcame a working-class background, moving to New York in hopes of making it as a poet. They achieved this long-fabled feat—which doesn’t seem to happen to anybody anymore—and have since published more than a dozen volumes of poetry and fiction including “Not me,” “Chelsea Girls,” “Cool for You,” and “Skies.” Their recent books span genres and include “Sorry, Tree,” The “Importance of Being Iceland: Travel Essays in Art,” and “Inferno: A Poet’s Novel,” “Afterglow: A Dog Memoir,” and “Evolution.” Always characterized by their experimental quality, wit, and creativity, Myles is certainly more of an artistic icon than an art school wannabe. Aside from reading from “Evolution,” Myles also read a speech they wrote following the 2016 election. In 1992, Myles ran for president as a write-in candidate, the same year that Zoe Leonard wrote her iconic poem, “I Want a Dyke President.” In Myles’ “Acceptance Speech,” they offer their own letter to the world, as if they had won that election. The letter is brimming with hope, painting a portrait of female empowerment, achievement, and utopia when the reality in 2016 was much graver, scarier, and uncertain—for women especially. In their speech, Myles lets us into an America that is almost satirical in the extent that it’s become a socialist, feminist, artistic haven, and maybe it’s that we receive it as a figment of absurdity that makes the piece so heartbreaking. Or perhaps it is because the policies of our current administration have moved us increasingly further away from the America under President Myles. It’s a tragedy when the idea of country defined by peace, collaboration, and goodwill is something that feels more funny and insurmountable rather than galvanizing and attainable. “There’ll be lots of free food. A lot of archery. Everyone will be a really good shot. We’ll get good at aiming, intentions, not killing. Oh yeah and we’ll send a lot of masseuses to Israel and Palestine. Everyone needs a good rub. No more pesticides, here, anywhere, lots of small farmers, an amazing number of stand up comedians, and lots of rehearsal spaces and available musical instruments and learning centers for people like myself who would like to play something, perhaps a guitar,” Myles read. As Myles read the letter, deadpan and serious as any real candidate would be, the room periodically erupted into laughter. There were also silences and moments of stillness as Myles’ sentences which, with their tangents and hyperactivity tying knots around themselves, at times unravel in one swift pull—unearthing insights so astute, succinct, and incisive that the murky streams of consciousness finally become clear. Viviane Eng can be reached at veng@wesleyan.edu.